Samui Heritage Resort - “Koh Samui’s Most Composed Private Hotel and Resort in Koh Samui Beach,Boutique Resort Koh Samui Thailand”. 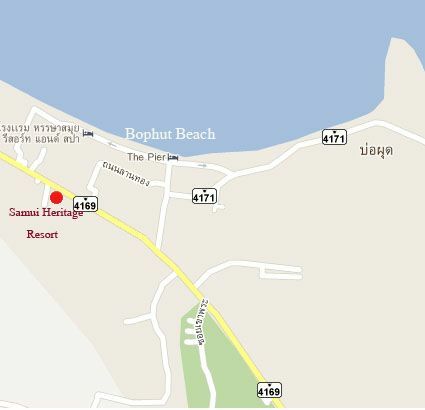 Question: How to find Samui Heritage Resort? From Samui Airport get in a transportation to the West (pass Bang-rak). When you arrive Bophut Intersection where is the location of Wat Bophut and Bophut police station. Turn right to around the island main road. About 500 meters on your left hand side you will find Bank of Ayudayah, Fah-Ta-Wee-Pron-Bophut. And 200 meters more on your left hand side again you will find the big sign of Samui Heritage Resort brown board with a white characters. Turn left and go straight until the end of beautiful Samui Grand Plaza. From Lamai beach get in a transportation to the North (Chaweng) pass three biggest supermarkets Tesco Lotus on the left hand side Marco on the right hand side BigC on the right hand side. Follow around the island main road until you arrive Bophut Intersection where is the location of Wat Bophut and Bophut police station. Go straight about 500 meters on your left hand side you will find Bank of Ayudayah, Fah-Ta-Wee-Pron-Bophut. And 200 meters more on your left hand side again you will find the big sign of Samui Heritage Resort brown board with a white characters. Turn left and go straight until the end of beautiful Samui Grand Plaza. From Lipa-Noi get in a transportation to the North (Nathon, Bang Makam, Bang Por, Meanum). When you arrive Bophut area on the left hand side you will find Anatara resort, family mart, and Baan Rak fun dental clinic. Then you look on the right hand side you will see Bon cafe and Samui Grand Plaza. You will find the big sign of Samui Heritage Resort brown board with a white characters. Turn right and go straight until the end of beautiful Samui Grand Plaza. Copyright © 2009-2011 All Rights Reserved. By Samui Grand Design & Construction Co., Ltd.